More than half of the population of the USA believe in the existence of life outside of our little blue marble. For scientists, the definition of “life” includes microscopic critters that they would wet their khakis to discover. If they found a two micron wide fossil of mold in the frozen poles of Mars it would change everything we know and believe about our universe. Americans like to gamble and I’m a very loyal American. I enjoy gambling and lately I’ve been gazing deep into my soul and wondering why? If you have to rough it, this is the way to go. I’m enjoying this existential exercise while sitting in a beautiful suite in the Palazzo Hotel Casino in Las Vegas. 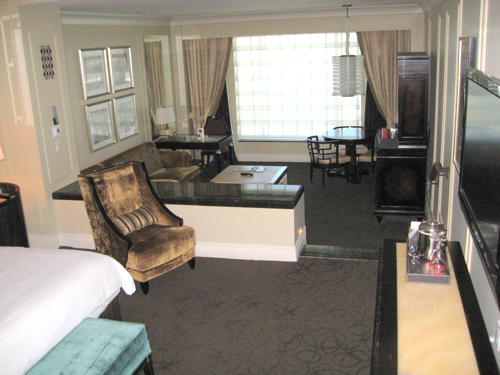 I feel that deep contemplation is best done in a comped suite with several flat screen TV’s and prompt room service. I feel a little guilty luxuriating here while so many people are unemployment and going through hard times. The poor economy in Nevada is actually the reason that I can afford this. I am what’s known as a low roller or maybe a minnow, as opposed to the better known high-rollers or whales of gambling. There is a dearth of big spenders in Vegas at the moment so the casinos have moved on to the schools of minnows who meander about in our loud Hawaiian shirts, carrying our players clubs cards and waiting for the buffet to open. Casinos that a few years ago would never have thought to offer comps to chubby middle America are suddenly treating us royally if only we’ll drop our pennies into the penny slots. The $50 Blackjack tables are a little dusty but the Hee-Haw slots are burning up.